I bought some chicory today and made chicken with chicory in Marsala sauce. Everything turned out really well, except the chicory is way too bitter for my taste. I noticed that the recipe uses red chicory, whereas I bought chicory looking like this. Would getting red instead of "normal" chicory already reduce bitterness? What are some other ways to reduce the bitterness of chicory? First and foremost, for both types remove the white core, which is the most bitter part. Some recipes omit that bit of instruction, assuming the reader knows this. Good produce matters in this case, too: fresh chicory / endive is only slightly bitter. If the heads have been exposed to light and warmth, they turn increasingly bitter. So if you can, buy them from stores where they are kept in dark boxes and choose firm, plump ( = fresh ) heads, then store them in the fridge at home. I would assume a similar mechanism for red chicory / radicchio, but it's not kept dark. But again, pick firm heads. And then there is preparation: A quick stir-fry will keep the bitter compounds inside the leaves, long braising will tend to extract them into the sauce, making the whole dish being percieved as more bitter. If that's too much for you, blanch first. Also, adding sweet or caramelly notes (a generous pinch to a spoonful of sugar in the frying pan) or aceto balsamico can mitigate the bitter taste. The bitterness of chicory can be ameliorated somewhat by blanching. Of course, you can also add sugar and/or salt. Those things might make chicory seem less bitter, but bitterness is what chicory brings to the table. If you don't like the bitterness, I suggest looking for a less bitter vegetable. Frisee is another type of chicory that is less bitter than the other types already mentioned. If even that seems overly bitter, move further towards the lettuces, like romaine, or other greens like spinach. and is grown in just a few places in Belgium and tastes quite different from the normal chicory (locally it's known as "sweet chicory"). Alternatively, parboil normal Belgian endives with a big spoonful of honey. 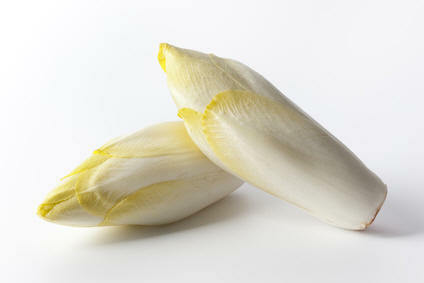 And with Belgian endives, take care to remove the core as Stephie mentioned already. I've cooked the same dish by Gordon Ramsay and the endive turned out disgusting. Turns out I used dry Marsala instead of sweet, which is normal for cooking with chicken, but in this case you're supposed to use sweet Marsala (and lots of it) so that the sweetness of the sauce balances the bitterness of the endive.